Wheeling-dealing foxes, maraca-shaking snakes and one very clever mouse come to Geelong next month in a play bringing children’s classic The Gruffalo to life. Armed with just a nut map and a very vivid imagination, Mouse sets out on quest exploring a predator-infested forest to hunt for hazlenuts. On her journey she encounters the smirking fox, party animal snake and an eccentric, retired ‘Woodland Air Force General’ owl. Rather than becoming the main course of their next meal, Mouse kills their appetites with stories of an imaginary monster friend. The mythical Gruffalo is a connoisseur of forest favourites like roasted fox, owl ice cream and scrambled snake, the clever rodent tells her foes. But what happens when Mouse comes face-to-face with the very creature she imagined? After sell-out seasons across the world, including London’s West End and Broadway, the monster show comes to Geelong Performing Arts Centre on 6 April at 12pm and 2.30pm. A trio of new performers will fill the onstage forest with colourful characters and toe-tapping, sing-along songs, with costumes to dazzle audiences. 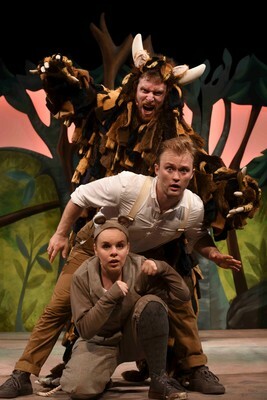 The Gruffalo won Sydney Theatre Awards’ Best Production for Children in 2015 and began touring the country again this year. Kids who miss the Geelong show can catch a glimpse of the mysterious Gruffalo at Melbourne Athenaeum Theatre from 9-14 April. The show beautifully captures the magic of Donaldson and Scheffler’s adored classic, according to a British critic. The Australian production received similar acclaim, with Sydney Morning Herald calling it “funny, charming and smart”, while Courier Mail described it as a “whale of a time” for children and parents.